Is there a sequel in 2018 more universally anticipated than “Incredibles 2”? Unless you’re a big “Hotel Transylvania” fan, I’d say no. Since “The Incredibles” debuted in 2004, it’s seemed to stand unanimous among film fans as the one Pixar movie that undoubtedly deserved a second installment. In our world of serialized comic book actioners, a sequel just organically made sense. As “Toy Story 3” premiered, then “Cars 2,” then “Monsters University,” then “Finding Dory,” then “Cars 3,” the ravenous cravings for a second “Incredibles” only seemed to worsen. Seriously — who except Disney bean-counters actually asked for “Cars 3”? Your four-year-old nephew, maybe, but that’s it. So what’s the verdict on “Incredibles 2”? It’s good. Not earth-shattering, but good. There’s plenty of reasons to praise the film, starting with the bounds and leaps that animation has taken in 14 years. This is saying something, since the original film’s animation was nothing to sneeze at. It seems a tired notion to praise the innovative nature of Pixar’s animation, but the advancements are so apparent in every new release that it’s difficult to cease discussion on it. Every fiber of Jack-Jack’s hair is rendered individually. Every wrinkle in a sleep-deprived Bob Parr’s shirt is laid in realistically. Even the physics of Elastigirl’s stretchy movements, the effect of Violet’s force-fields on their surroundings, and the abilities of new characters (which I don’t care to spoil here) seem thought out with meticulous care. The storyboards on Brad Bird’s office walls must been their own masterful collection of art. Because of their adherent loyalty to the rules of the real world, both “Incredibles” movies seem like the only Pixar entries that may have actually worked in live-action, and the achievement of this team in expertly calculating that twice is worth the price of admission itself. 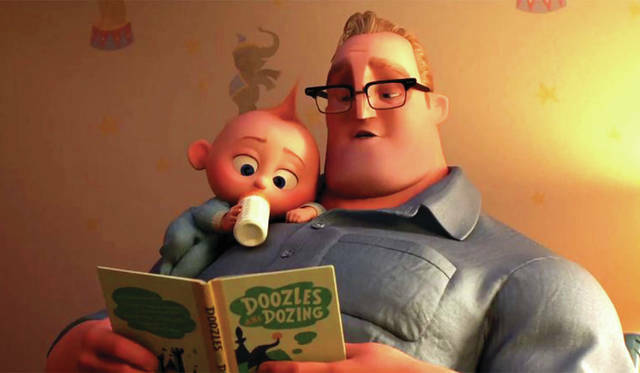 “Incredibles 2” has a lion’s share of action sequences (including an extended opening in which the entire Parr family fights the Underminer, which was incredibly satisfying given that that Underminer reveal in Part 1 was what teased a sequel in the first place), but it’s very smart of Brad Bird to weave all of the action consequently around the dynamics of the Parr family. Both films, for all their kinetic energy, are family affairs through-and-through. It’s only because each member of the Parr family is fleshed out as a unique character that emotional stakes exist so heavily in moments of actual peril. Also, the art direction and design of this world deserves a shout-out. The retro faux-60s backdrop still feels incredibly hip, but it also gives credence to the emphasis on fashion that runs throughout this franchise. Between Edna Mode’s passionate work on the supers’ costumes and the Sean-Connery-era-James-Bond suits that every other male character seems to wear, the viewer never questions all the sharp wardrobing because it matches the rest of the world so seamlessly. Michael Giacchino’s brass-laden, big-band score, presumably paying homage to the late John Barry, is filled with so much bombast and gravity, even menial moments with these characters have emotional weight. Across the board, the movie looks and sounds stellar. That’s no shock. Where “Incredibles 2” falters, however, and it really pains me to admit it, is its script. Perhaps writer/director Brad Bird was simply working under limited constraints, but what’s been delivered here is a relatively predictable narrative littered with story beats familiar to almost anyone who has ever seen movies. Considering the enormous gap between the release of these films, that’s puzzling and difficult to forgive. It’s okay for the basis of this family’s angst to involve Elastigirl going back out into the frontlines while Mr. Incredible stays home to be Mr. Mom, but that formula as a primary struggle is very tired in 2018. It might’ve worked better as a running joke, somehow sprinkled into the proceedings as a means of contemporary commentary, but as is, it plays like an overly blatant attempt to lay on an already societally-accepted message. Anyway, this wouldn’t have mattered much if the film’s antagonist had been better developed. There’s an hour or more of “Incredibles 2” in which viewers are just waiting for one of the heroes to realize who the bad guy is. I’m not the type to actively predict what’s going to happen during a film, but 15 minutes into “Incredibles 2,” the true identity of the masked villain is telegraphed pretty clearly, even though it’s not revealed until the beginning of the third act. Part of me hoped midway through that this in itself was a red herring — that clever filmmakers were simply leading us astray by making us assume a tried-and-true trope was in play — but alas, a tried-and-true trope was in play. Despite a decent execution of the trope, that lack of subversion is a bit disappointing. It’s not much fun for viewers to be that far ahead of the heroes, and the storytellers should’ve known better. Also, “Incredibles 2” had some issues paying off everything its first two acts set up. For example, we spend a lot of time with that baby — a lot. It’s not a crime, necessarily; seeing Jack-Jack’s various powers manifest one by one offers up many funny moments, and it gives other characters something genuinely interesting to react to when superhero action is sparse. The viewer is led to assume, though, that Jack-Jack will then have a really big part to play in the film’s finale — that, comedically or otherwise, it’ll largely be Jack-Jack who saves the day. That doesn’t happen, really, and in hindsight, it made what initially seemed like legitimate narrative set-up into mere slapstick-stalling-for-time. And just a personal quibble — Dash doesn’t get a proper Dash scene. You know what I’m talking about — Dash had arguably the greatest sequence in the original film, and there’s not a single scene in “Incredibles 2” that highlights his abilities. One would assume the filmmakers would be tempted to build a sequence to rival that original one, but it’s not there. The one major thing working against this film is its own hype. I myself made the mistake (as I have with other films in the past) of assuming that the 14-year gap was somehow synonymous with the definitive quality of the film, as if to say, Well, if it took them 14 years to bring us this, they must have come up with something really, really great! Otherwise, there’s still a lot of people who are just eagerly anticipating a movie we probably should’ve gotten nine or ten years ago, which in turn makes the anticipation of many a little disproportionate. In the end, that’s not fair to this movie. It’s probably best to go into “Incredibles 2” pretending the year is, say, 2009. Before shared cinematic universes were commonplace, before Disney Animation Studios revamped itself and started making hits again, and before Pixar itself had ever released anything disappointing, this movie wouldn’t have had nearly as much pressure on it. Under a more limited perspective, and on the movie’s own terms, “Incredibles 2” is a lot of fun and worth its title. Even if its story feels less fresh than the first film, the movie still feels like a very natural extension of the original. The tone has been maintained, character portrayals are consistent, the action is just as good, and the comedic moments are arguably even stronger. It seems apparent that “Incredibles 3” is on the horizon — not another 14 years out, hopefully — and the fact that I’d welcome an “Incredibles 3” with open arms says a little about the flexibility of Part 2’s flaws. It’s just so nice being with these characters again, it’s okay in the end if parts of the experience aren’t perfect. 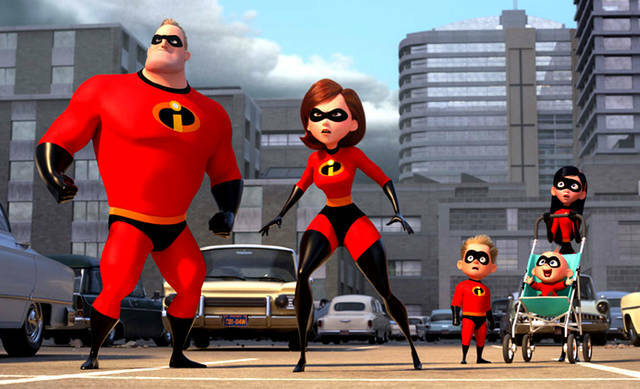 In the long run, I think “Incredibles 2” will play better as the middle installment of a trilogy rather than just the long-awaited follow-up to Part 1, but for now, as a means to simply bring our long-absent supers back into the sunlight, “Incredibles 2” shines admirably enough.